Birmingham hosts ten days of magnificent music as the city's annual Jazz & Blues Festival comes to town from July 3 to July 12. Almost 200 performances have been organised at a range of venues – and the vast majority are free. The festival's newest stage is in the Jewellery Quarter's Golden Square. Shows include The Digby Fairweather Quartet (12pm, July 9), Hot Jazz Alliance (12pm, July 10) and The Schwings featuring Laura Budreckyte (11.30am, July 11). The Schwings are from Lithuania and are best known for their gypsy, Brazilian jazz and swing tunes. 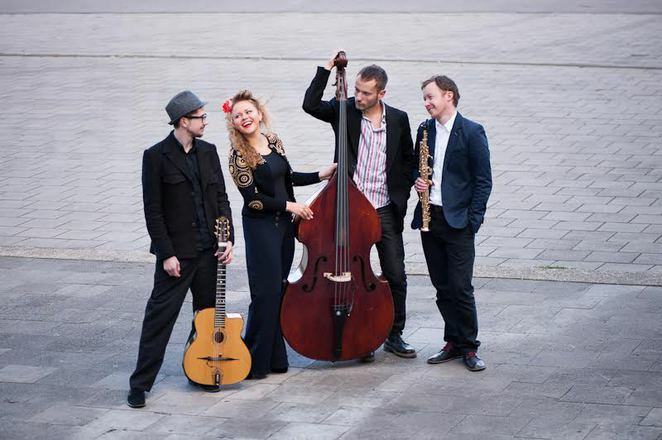 Singer Laura Budreckyte is a graduate of the Lithuanian Music and Theatre Academy and a past winner of the Jazz Voice competition and the Grand Prix at the international Riga Jazz Stage contest. They can also be seen at The Mailbox (12.30pm, July 9), Pushkar (8pm, July 9), Le Monde (5.30pm, July 10), Kings Head, Bearwood (9.15pm, July 10) and The Drop Forge (8.30pm, July 11). The Mailbox in Commercial Street has an enticing line-up of lunchtime (12.30pm) shows by international artistes. From France there is Florence Joelle (July 3) and Les Zauto Stompers de Paris (July 12), from Luxembourg there's Saxitude (July 4), Sweden is represented by the Stockholm Stompers (July 5) and the UK has Malaya Blue (July 6). The multi-cultural Harper's Ferry (USA/ UK/ New Zealand) perform on July 7, American/ Australian combo Hot Jazz Alliance can be seen on July 8, on July 9 it's Lithuania's The Schwings, Italy's Pepper & The Jellies play on July 10 and the Jerry Senfluk Quartet from the Czech Republic perform on July 11. 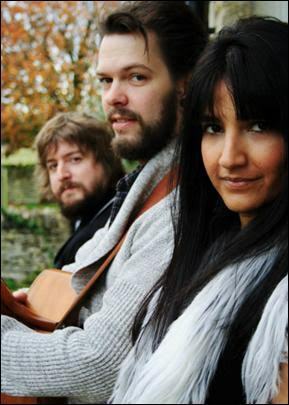 Gloucestershire-based Harpers Ferry are worth seeing – the folk/ rockers have a story-telling approach similar to that of acts in the late '60s/ early '70s. Catch them on July 4 at Caffe Nero, BrindleyPlace (1.30pm), New Street Station (5pm) and Grosvenor Casino (9pm), on July 7 at the Black Eagle, Hockley (8pm) and on July 8 at The Brasshouse (12.30pm), Cafe Opus (5.30pm) and Hampton by Hilton (9pm). Launch: The Rumblestrutters - Jon Toft, Jonathan Nicholas, Liam Ward. 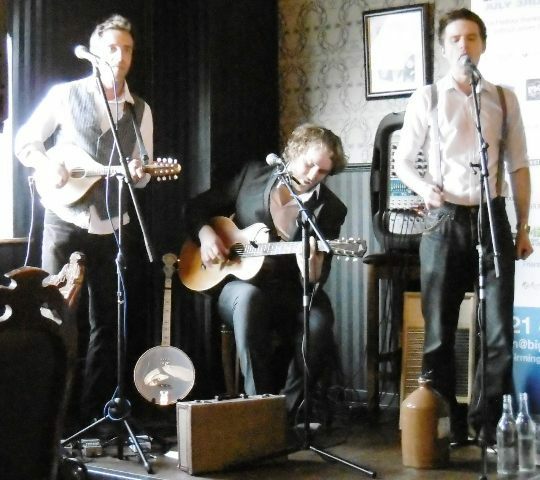 The Rumblestrutters were chosen to play at the festival's programme launch event. 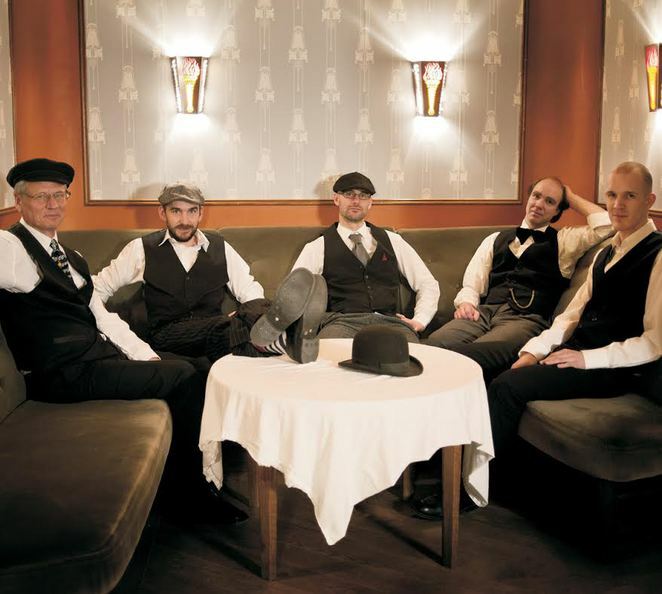 Based in Swansea, south Wales, they are a jug band that mixes jazz, blues and ragtime. See them on July 3 at Pizza Express, Sutton Coldfield (3pm) and Bacchus (8.30pm). Blues duo The Whiskey Brothers have a new album, Bottle Up & Go, to promote so singer/ mandolin player Richard Heath and pianist Gerry Smith will be busy during the festival. Catch them at Sam's Jazz on the Water, Gas St Basin (1.30pm, July 4), Praza, Hagley Road (7.30pm, July 6), West Bromwich Library (7.30pm, July 8), Great Barr Library (7.30pm, July 9), The Black Eagle (8pm, July 10), Hampton by Hilton (1pm, July 12) and Pure Bar & Kitchen (5.30pm, July 12). 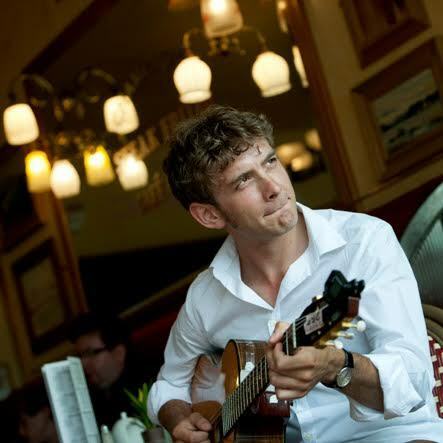 Paid-for festival gigs include Kansas Smitty's House Band at St George's School, Calthorpe Road (7.30pm, July 3, £12), Derek Nash Quartet at the Botanical Gardens (2pm, July 5, £7/ £4.75), Midland Youth Jazz Orchestra at the Botanical Gardens (7pm, July 5, £15) and Guitar Superjam with Adrian Ingram, Lee Jones and Remi Harris at the Electric Cinema (7pm, July 8, £10/ £8). Admission prices also apply for Tipitina with Pete York at The Edgbaston (8pm, July 9, £15), King Pleasure & The Biscuit Boys at The Jam House (8.30pm, July 9, £5.50), Lady Sings The Blues at the Library of Birmingham (7pm, July 10, £12), Andy Fairweather Low at Solihull Arts Complex (7.30pm, July 10, £21), Digby Fairweather's Half Dozen at Hagley Road Village (7.45pm, July 11, £10) and Walsall Jazz Orchestra at the Botanical Gardens (7pm, July 12, £10).